Today is our D-day anniversary. 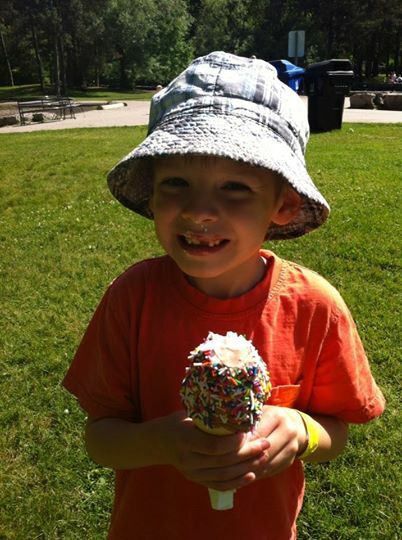 Four years since the words, “Gavin has a brain tumour,” utterly exploded our world into thousands of pieces. Four long years of putting those little pieces back together in a way that makes sense, although nothing has ever been the same, nor will it ever be. I learned yesterday that Monday’s MRI was clear! Our clinic appointment yesterday was routine. I could see by the way that the fellow came in and started chatting casually that she didn’t have any major news for me – I assume if there was something dire to be shared that there would be some sort of observed protocol, not “Hi, how are you guys today?” But prior to her entrance I allowed those fearful thoughts a moment’s notice and found myself shaking and on the verge of vomiting. Thankfully, my mother was there to keep it together with Gavin and kept him busy with colouring. My stress was needless, all is well with scans, although all is not well with Gavin. I had a long talk with his oncologist about what we could possibly do now to try to bring Bean to wellness. I left with a few more thoughts and have decided to try a new medication which might help. She described his current condition as “annoying but not tragic.” I can see the truth in those words. This chronic illness can be exhausting to manage, but at least we have good days. We are not at the end of our rope, going home on palliative care as so many little ones I know have. I know many families who would be happy to walk in our shoes for awhile. The past six months have seen me suffering a great deal of burn-out with managing Gavin. It’s hard to feel that everything will be okay when things are so consistently un-okay. I hate going out to run an errand and then getting a phone call that Gav needs to be picked up from school right away. Chores left undone, groceries abandoned, and classes unattended have all stacked up to make me feel that finding any sort of routine for him or me is completely impossible. And yet, I still strive to do this, and we celebrate every birthday party and play-date he is able to attend. Actually, precious boy, it wasn’t the best day of my life, obviously that day was September 3, 2008, otherwise known as your birthday. But it was definitely top ten!